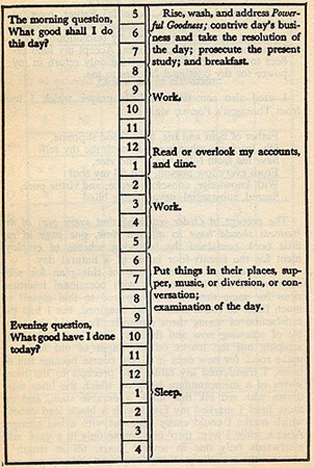 Elsewhere is a copy of Benjamin Franklin's daily schedule, as found in a book. Below is what I imagine Mrs. Franklin's daily schedule really looked like. Rise, wash Ben's clothing, feet, and bum powder Ben's wig; chop wood for cooking breakfast; feed and clothe Ben's illegitimate son from one of his many affairs; milk cows; feed chickens and collect eggs; tend to garden; wash linens; repair feather bed; darn socks. Open Ben's dry goods store and handle all manner of accounting, sales, and transactions while he sits on the bum I washed earlier; listen to Ben and his crazy ideas "blah blah blah"; chop wood for cooking midday meal. Prepare midday meal for Ben; stop Stamp Act rioters from burning down our house; apologize to Ben for not listening to his new lending library idea while fending off Stamp Act rioters; listen to Ben prattle on about how much more obedient and affectionate common-law wives are in London. Clean kitchen and return unused rations to larder; return all correspondence to Ben's political allies and rivals; birth baby; oversee construction of larger house to accommodate Ben's library; plan Ben's upcoming trip overseas for "the big printing press expo." Chop wood for supper; prepare supper for Ben and illegitimate stepson; teach illegitimate stepson how to read and write. Put illegitimate stepson to bed; say nothing when that lush Thomas Jefferson shows up unannounced and takes Ben out gallivanting; work on stitching for embroidery sampler while waiting up for Ben; chop wood to prepare snack for Ben and Tommy J., who'll come back to our place and start talking about "getting the band back together" and jammin' too loud on the violin and glass armonica outside. Climb ladder and check on kite during thunderstorm; write down "Ben's observations." Kill large spider in barn so Tommy J. stops shrieking; coax his still-drunk bum out of the rafters.